A Chicago Tribune report says federal investigators have made covert tape recordings of Illinois Governor Rod Blagojevich as part of their corruption investigation. Reach as far back into Illinois history as you like and your hands will likely come out dirty. 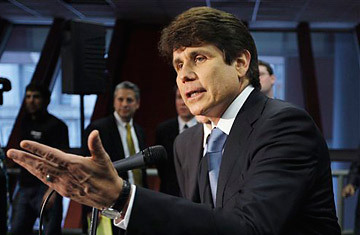 Blagojevich is the sixth Illinois governor to be subjected to arrest or indictment  seventh if you count Joel Aldrich Matteson (governor from 1853-1857), who tried to cash $200,000 of stolen government scrip he "found" in a shoebox. Matteson pulled a "how-did-that-get-there?" excuse and escaped indictment by promising to pay it back. (Oddly, this isn't Illinois's only shoebox-full-of-money scandal; after former secretary of state Paul Powell's death in 1970, a search of his home revealed shoeboxes full of hundreds of thousands of dollars in checks made out to him by unsuspecting Illinois residents who thought they were paying license plate registration fees). Lennington Small served as Illinois governor in the 1920s, during which time he was charged with embezzling over $1 million in state funds. Small went on trial in 1922  while still serving as governor  and despite substantial evidence, he was acquitted and went on to serve seven more years in office. After his trial, four of the jurors received state jobs. In 1965, four years after leaving office, William Stratton was indicted on charges related to misuse of campaign funds. While he was acquitted, his successor, Otto Kerner, wasn't so lucky. In 1962, during his first term as governor, Kerner  a handsome statesman who had married a former Chicago mayor's daughter  made deals with a horse racing association, promising favorable race dates in return for $356,000 worth of stock at prices far below market value. He neglected to mention anything about it on his tax returns. Kerner was convicted in 1973 of bribery, conspiracy, income tax evasion, mail fraud and perjury and was sentenced to three years in prison. Dan Walker, a veteran of World War II and the Korean War who made a name for himself by heading up the investigation into the riots at the 1968 Chicago Democratic National Convention, came into office the same year Kerner was convicted; after he left, he started a savings and loan business and was indicted for making $1.4 million in fraudulent loans, which he used to pay personal expenses including maintenance on his 80-foot yacht. Walker pled guilty, saying, "I have deep regrets and no excuses." He was sentenced to seven years in prison but served only 17.5 months. The last governor before Blagojevich to be charged with a felony was the last governor Illinois had before Blagojevich, George Ryan. Prior to taking office, the cigar-chomping wheeler-dealer served two terms as secretary of state, from 1991-1999. In 1994, a fatal truck accident outside Ryan's office inadvertently exposed a scheme to trade truck operators' licenses for political contributions. The subsequent investigation, called Operation Safe Road, took years to complete; when it was done, 79 people were charged, including Ryan. The former governor was found guilty on 18 felony counts, including racketeering conspiracy, mail fraud, tax fraud and lying to the FBI. In addition to the license-for-money scandal, Ryan had exchanged government favors for family vacations, tickets to events and other gifts. He is currently serving a six-year prison sentence in Indiana. In 2005, he was nominated for a Nobel Peace Prize for his most famous act as governor: commuting the death sentences of over 160 Illinois inmates. And those were just the governors. In 1895, a group of Chicago aldermen known as the Gray Wolves (because they preyed on the public) awarded the city's gas business to the fictional Ogden Gas Company  in which the Wolves were involved  and forced the real gas company to purchase it from them. There's also the state auditor who stole $1.5 million and used it to buy two planes, four cars and three homes before spending six and a half years in prison; the Prison Review Board member who voted to free notorious mobster Harry Aleman in exchange for getting his son a Las Vegas singing job; and the city employee who ran a heroin distribution ring out of Chicago's Department of Water Management. In Chicago's Hired Truck Scandal of 2004, trucking companies on city contracts were discovered to have links to city employees, convicted felons and the mob. And of course there was the time Mayor Richard M. Daley hired John "Quarters" Boyle  a man previously convicted of stealing $4 million (in quarters) from the Illinois Toll Highway Authority  for a Department of Transportation job. When asked in a press conference whether stealing $4 million from a public agency disqualified someone from a city job, Daley replied, "No, I don't think so." Boyle went on to take hundreds of thousands of dollars worth of Hired Truck bribes, for which he was eventually convicted. "Everyone else was doing it," he later said. In Illinois, that may be a bit too close to the truth.